​Yucheng Cao is a Ph.D. in Education student specializing in Language, Literacy, and Technology (LLT) at the University of California, Irvine. She received her master’s degree in Teaching English to Speakers of Other Languages (TESOL) from the University of Southern California in 2016. Before entering the doctoral program, Yucheng worked as a creative writing tutor for K-12 students in a non-profit organization, taught English reading and vocabulary for middle school students in China, and served as an advisor for the Mandarin program at a trilingual preschool in the city of Alhambra. 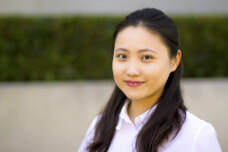 While earning her master’s degree, Yucheng observed an evidence-based reading course and tutored the adult students of diverse socio-cultural background in LA Technology Center. Her language learning and teaching experiences make her particularly interested in second language learning and acquisition, reading and writing development, and multicultural teaching.